Although most of the small birds cleared out with the cold weather, a few species remained that wintered at 8,000 feet: mountain chickadees, nuthatches, woodpeckers, Clark's nutcrackers, Stellar's jays, magpies and ravens. I hung out suet in addition to sunflower seeds to help the small birds survive the cold. One day in early October when I was sitting at my desk, I was startled by a loud "bonk" on the window to my right. Birds often collided with this window, which apparently reflected a lot of sky as the sun desceded towards the horizon. Sometimes I heard birds hit it two or three times a week. Usually they glanced off of the window and flew on. A couple of times during the summer hummingbirds knocked themselves to the ground by hitting it at their reckless high speed. When I rushed out to one and began to touch it to see if it was still alive, it emitted a started "Cheep!" and twirred quickly away. The other hummer recovered itself and disappeared before I reached it. But the bonk on that October day was the loudest bonk I'd heard. I stood up and looked out the window. Seeing an immobile bird on the ground, I rushed out to see if it was still alive. It was a mountain chickadee, a tiny (5 ¼ inch) grey bird with a black-and-white head, a member of the diminutive, busy-body Titmouse family. It was lying on its breast, legs clutching pine needles behind it, with wings slightly spread. The only movement it made was the blinking of its left eye. The right eye was closed. Its beak was open. I wondered if it had broken its neck; but if that were the case, its eye wouldn't have been blinking. I hovered over it, stroking it to see if I could get a reaction. But no reaction came. The bird was in shock and it was freezing outside. It needed warmth. So I picked it up carefully, pulled the pine needles gently from its feet, and rushed back into the house where I sat with it in cupped hands in front of the propane fireplace. After a few minutes of warmth, it began to blink its right eye along with its left, closed its beak, and moved a little. I took it back outside, crouched next to an Adirondack chair and opened the palm in which it sat. It managed to jump an inch or two onto the arm of the chair where it clung to the near edge with its little bird feet. I was saying OM MANI PADME HUM in a low voice and sending light and warmth to it from my heart. Although it didn't move, its feathers gradually fluffed up, seemingly through the simple act of breathing, as it continued to sit there blinking its black eyes. I could see its breathing by the expansion and contraction of its white chest. Finally it moved its head from left to right and back again, looking around as if confused. Where am I? it seemed to be wondering. But it made no attempt to fly. Because it was cold, I stepped back into the house and watched it through the sliding glass door to see if it would move. The chair arm where it was sitting was about two feet from the window. The bird just sat there without moving. I went back out and again crouched next to the chair and spoke softly to it. "Are you okay? Do you need to get warm again in order to recover from the shock?" The chickadee looked at me without fear. I thought it might still be dazed. I gently pried its feet loose from the chair and cupped it in my hands again. Back inside I sat resolutely on the coffee table before the fireplace. The bird was in my left palm with my fingers curled lightly around it, tail feathers sticking out between the thumb and index finger. My right hand was poised over it with the circle of my thumb and index finger open above its head. I did not want it to suddenly fly out of my hands into the beams of the living room where the skylight windows might confuse it, cause it to panic and be hard to catch - as I had experienced with hummingbirds. I continued to say mantras and send it light and warmth. After five more minutes of warmth I peeked into my hands to see how it looked. Its head was moving back and forth and it was stirring a little. "Are you ready to go back out?" I asked. I felt it was and stepped outside. Again I opened my palm. The chickadee, one of dozens who frequented the birdfeeders at my neighbor’s and my houses, turned its head toward me and looked me in the eye. My face was not more than a foot from its tiny head. It showed no fear and simply looked at me for a few seconds. As we gazed at each other I smiled: "You okay now?" It turned its head and looked at the arm of the chair directly below my palm, then jumped onto the light dust of snow on the arm. It bobbed its tail and defecated. I thanked it silently for waiting to fulfill this need and slowly stood up, not wanting to startle it. After a few seconds, it flew onto the back of the chair. As if getting its bearings, it jumped from one upright on the back of the chair to another, turning this way and that, looking around. Then it flew the short distance, about a yard, to the corner of the house where it clung sideways, then to a pipe under the eaves where it again clung sideways. Finally it flew to a tall tree across the road. I breathed a sigh of relief and turned back to the door with an inner smile. Another creature rescued. Another success. I wondered how many birds and mammals I had revived and returned to freedom. I hadn't counted, but I thought perhaps as many as I hadn't been able to save. An equal number, probably, of successes and failures. But, I thought, it's always worth a try; for when I do succeed, I feel thankful for the opportunity to see the life force of a wild creature regain enough ground in the hands of a human to carry on. Such encounters are like grace. They give me faith. About a week later I began to notice that I was frequently seeing a mountain chickadee clinging to the outside of the kitchen window, looking inside at me, and then flying the short distance to the bird feeder that hung two feet beyond the window. This feeder was designed especially for the small birds. Larger birds and squirrels that scared the little ones away couldn't take advantage of it, so the little birds didn't have to compete with them. Thus the feeder was a busy place, with many species of small birds coming and going throughout the daylight hours. However, the mountain chickadee was the only species to land on the window. Occasionally I also saw a mountain chickadee performing the same trick on the outside of the glass door to the deck, which was the next window to the left. Mountain chickadees seemed able to gain a foothold on just about anything. The windows in our cabin were composed of thin vertical and horizontal wooden mullions that contained smaller panes within the larger wooden frame. Both the door to the deck and the kitchen window were in this style, and the chickadee always landed on a horizontal mullion at about eye level when I was standing up. Of course I immediately wondered whether the mountain chickadee looking at me through the window was the one that I rescued from freezing to death while in shock. I realized that I would have loved to think that it recognized me and was trying to communicate with me. However, because I would have liked to think that and because I thought it improbable, I discounted the possibility. I would have needed solid proof that it was the same bird, but I couldn't tell one bird from another of the same species when there were so many of them. So, trying to be reasonable, I thought that whatever bird landed on the windows could be any of the several mountain chickadees that were frequenting the feeder. Perhaps several of that species could be doing this, one at a time. There didn't have to be only one mountain chickadee that was looking at me through the window. 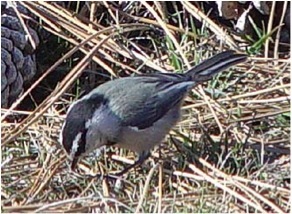 Then one day, one particular chickadee did get my attention in such a way that I had to wonder: Is this the one? I was out on the deck filling a bucket with sunflower seeds. I had just refilled and re-hung the birdfeeder. My back was to the trees growing through the deck, and in front of me on the table was a full bucket of sunflower seeds. Right behind me I heard the sound of a chickadee and turned around to see a mountain chickadee looking at me and talking to me in its raspy voice. It flew to a branch over my head and looked from me to the bucket and back to me. I took half a step back from the bucket and the bird landed on the rim. It looked at me and then dipped its head into the bucket, picked up a sunflower seed, then flew back to the tree. All of this took place within about fifteen seconds, but a couple of things seemed worth noting. First of all, it was the first time a mountain chickadee had voluntarily come so close to me. They usually kept their distance. But this one showed no fear of me. It acted familiar, as if it knew me. Secondly, I had just hung the feeder up, so it didn't need to get a seed from the bucket, unless it wanted to take the opportunity to say "Hi." Was it the one I had rescued? Was it saying, Hi, remember me? Was it letting me know it knew me and remembered our encounter? Was it letting me know it was all right? I wondered if I was crazy. However, the last thing worth noting was that after the encounter at the sunnie bucket, I never again saw a chickadee clinging to the window and looking in at me, though chickadees continued to use the feeder. At this point, I feel less shy about interpreting the encounter at the sunnie bucket as that particular chickadee’s gesture of gratitude by showing that it knew and trusted me, and recognized that I was the one who filled the birdfeeder. It clearly wanted to get my attention. When it got my attention, it was as if the chickadee bowed to me in acknowledgement and thanks. And that was enough. The exchange of reciprocity was over – at least for the chickadee. For me, however, it was a gift that inspired me to look further into the realm of human experiences of reciprocity with wild animals, which in turn has strengthened my belief in the animistic soul’s need for numinous, magical experiences with fellow creatures of the Earth. And that, in turn, is one of the convictions that has inspired this website.